External treatment for blowfly control in sheep. 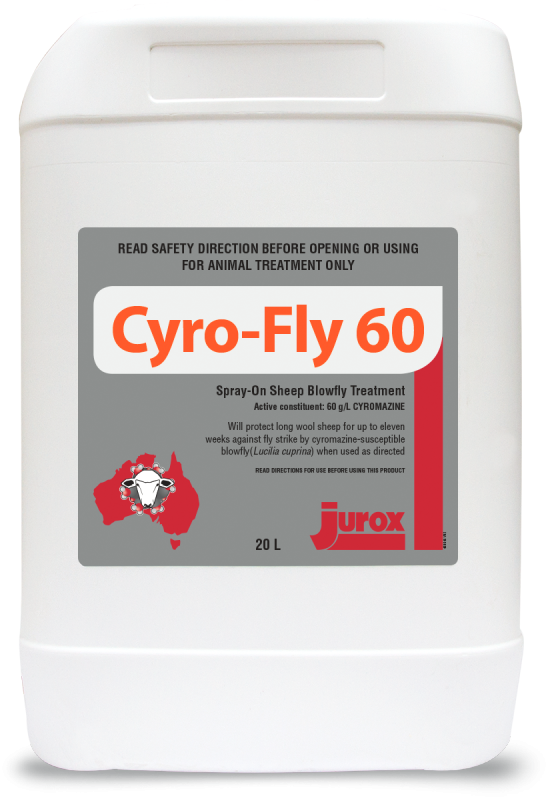 Cyro-Fly 60 Spray-On Sheep Blowfly Treatment will protect long wool sheep against fly strike for up to 11 weeks when used as directed. Meat: DO NOT USE less than 7 days before slaughter for human consumption. Milk: DO NOT USE on female sheep which are producing, or may in the future produce milk or milk products for human consumption. DO NOT USE less than 28 days before slaughter for export. Rams and sheep susceptible to poll strike should be treated. Apply at least 5 mL of Cyro-Fly 60 Spray-On to the areas requiring protection, around the poll and horns. 1. Use only a Jurox-recommended Spray-On applicator..
2. Ensure the applicator gun is clean. 3. Calibrate applicator gun using an accurate volume measure. 4. Ensure all areas to be protected are treated. 6. This product is not ideal for treating existing strikes. Treated larvae may take 3-4 days to die. Use a diazinon knockdown product as a dressing for existing strike. 7. Heavy rain following the application of this product could diminish the period of protection. 8. Cyro-Fly 60 Spray-On is coloured for band identification. This scourable dye will disappear shortly after treatment.